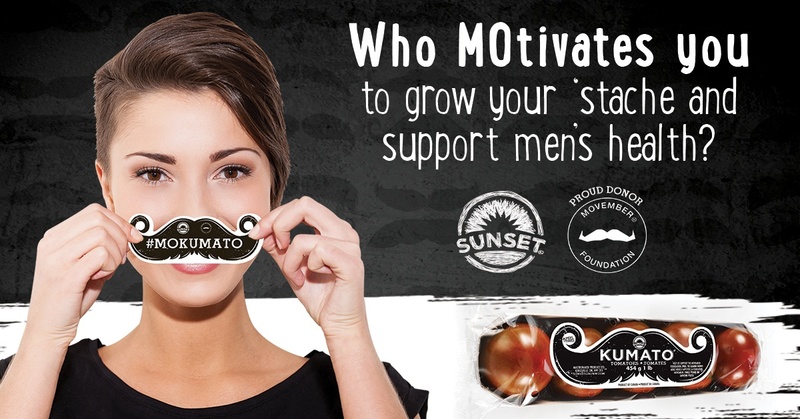 #MoKumato: Who MOtivates you to support men's health? Calling all ‘stache growers and lovers! We’re celebrating men’s health the whole month of November with a special #Mokumato giveaway for you or that special guy in your life. You won’t want to miss out on the chance to win one of four deluxe prizes we’re giving away all month long- and they’re SUPER easy to win, too. Share a photo with our #Mokumato ‘stache and/or a story about what MOtivates you on Facebook, Twitter or Instagram (or all three!) using the hashtag #Mokumato and tagging @sunsetgrown. It’s as easy as that! Download your own printable #MoKumato ‘stache here, or find one on specially marked packages of Kumato tomatoes! Need some inspiration? See what our friends are posting at sunsetgrown.com/mokumato! The potential Winners will be selected in a random drawing to be held on the Friday of each week of the month of November 2016. All entries must be received by 11:59:59 PM ET on November 30, 2016. Entries submitted past the expiration of the Promotion Period will not be accepted.